Pizza Soufflés, Fast-Food News, Tea with HG & MORE! New Flavors! 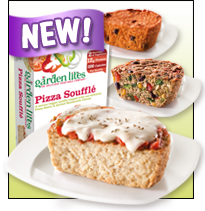 Garden Lites Soufflés - If you haven't yet tried Garden Lites' line of frozen veggie soufflés, now is SO the time to do it. The latest varieties are completely unique: Southwestern, Pizza (THE BESTEST), and Carrot Raisin. Each 7-oz. soufflé has 180 - 200 calories, 0 - 4g fat, 230 - 650mg sodium, 30 - 42g carbs, 3 - 5g fiber, 4 - 26g sugars, and 9 - 12g protein (PointsPlus® value 4 - 5*). Click here and track down the freezer case nearest you that stocks 'em. Kozy Shack Lactose Free Puddings - Having tried some lackluster lactose-free items, we weren't super-excited about these... until we tasted 'em. They are GREAT, whether you're a lactose-avoider or not! In Chocolate, Rice, and Tapioca varieties, each 4-oz. snack cup has 120 - 130 calories, 3 - 3.5g fat, 130 - 140mg sodium, 20 - 22g carbs, 0 - 1g fiber, 13 - 17g sugars, and 3 - 4g protein (PointsPlus® value 3 - 4*). These are rolling out now, so look for them with the refrigerated pudding snacks. New Varieties! Pace Restaurant Style Salsas - Every now and then, Pace throws a few new flavors at us. Some stick around; some fade away (R.I.P. Triple Pepper). The new crop in the Restaurant Style Salsa lineup features Garden Pepper, Garlic & Lime Verde, and Southwest Chipotle. Each 2-tbsp. serving has 10 calories, 0g fat, 130 - 140mg sodium, 2g carbs, 0g fiber, 1g sugars, and 0g protein (PointsPlus® value 0*). Grab some from your local supermarket -- don't forget some cut veggies for guilt-free dipping! Big Burger King News: Better-for-You Finds, Copycats, and the Inevitable Shockers! You may have heard about the new menu options at BK, but we're dishing the scoop on the stats. Read up! 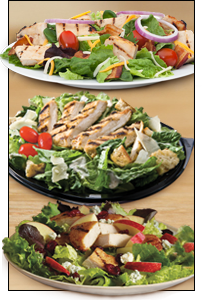 First of all, Burger King has added three exciting Garden Fresh salads to its menu: Chicken BLT, Chicken Caesar, and Chicken, Apple & Cranberry. The good news is that you can choose either Tendercrisp (fried) chicken or Tendergrill chicken for each salad. The shockingly bad news is that each one comes with around 200 calories' worth of fatty dressing! We're talking nearly 20g fat from salad dressing, people. Skip those heavy dressings, and go Tendergrill -- then each salad will have 310 - 340 calories and 8 - 16g fat (PointsPlus® value 8 - 9*). Ask for the Lite Honey Balsamic (120 calories, 7g fat -- PointsPlus® value 3*), and only use half the packet; it's WAY more dressing than you need. As for the other new offerings, they're pretty direct rip-offs of McD's menu items... with no apparent improvements! While the BK bigwigs boast that their snack wraps each have under 400 calories and feature "seven premium lettuces" and "all white meat chicken," we don't find that too impressive for a tiny fried-chicken rollup... especially one that packs 21g fat (and a PointsPlus® value of 10*). And as much as we enjoy seeing David Beckham's glorious mug in the new commercials, we're not falling for the smoothies... especially those oversized options. Up to 450 calories and as much as 85 grams of sugar = TOO MUCH. The frappés are even worse, with 410 - 600 calories and no less than 19 grams of fat per drink... Not worth it! Bottom line: Special order the salads, but skip the crispy chicken and calorie-packed beverages! Tea All That You Can Tea! Tea Time: Mmm-azing New Finds! Pardon the terrible wordplay, but we've sampled some TEA-RIFIC sips recently. You truly must try them! Lipton Tea & Honey To Go Packets - If you're not 100 percent on Team Tea, this is an excellent way to acquire some team pride. This line of fruity drink mixes is packed with flavor but not a ton of sugary calories. Only 5 calories per half-packet serving (8 oz. prepared), and it features amazing varieties like Black Currant Raspberry Iced Black Tea, Mango Pineapple Iced Green Tea, Peach Apricot Iced Black Tea, and Strawberry Acai Decaffeinated Iced Green Tea. Totally refreshing! Brew Over Ice K-Cups - Is waiting for your freshly brewed tea to chill too tedious for you? Check this out. Just pop a Celestial Seasonings Perfect Iced Tea pod into your Keurig machine, follow the directions, and BOOM. Perfect iced tea. 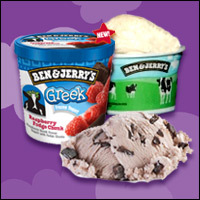 Flavors include Southern Sweet, Half and Half, Sweet Raspberry, and more. Each of the perfectly and naturally sweetened varieties has 54 - 70 calories (PointsPlus® value 1 - 2*); the Unsweetened Black Tea is calorie-free. Pssst... There are also a couple of Green Mountain iced coffee options for java lovers! Celestial Seasonings Bengal Spice Herbal Tea - Time to get spicy, but not too spicy. This is like a sweet 'n mild take on chai tea -- one that even people who think they don't like chai will enjoy. Desserty and delicious, comforting and caramel-y... plus it's caffeine-free (and calorie-free too). What are you doing still reading this? Get to the tea aisle of your local grocery store! The buzz has been hot around Ben & Jerry's new Greek Frozen Yogurt, but check the stats before you dig in -- some flavors are higher in fat and calories than you might expect. At the "Scoop Shop" locations, the vanilla option is the best pick with 150 calories and 4g fat per scoop (PointsPlus® value 4*) -- the other flavors have around twice the fat. The packed pints have 180 - 210 calories and 5 - 8g fat per half-cup serving (PointsPlus® value 5 - 6*), but it can be hard to stick with just half a cup. Our at-home suggestion? The single-serve containers! ***Those ice-cream-loving hippies aren't the only dudes changing things up. Larry, the friendly face of Quaker Oats, has gotten a makeover -- the changes are subtle, but his hair is a bit shorter, his chin and cheeks look slimmer, and he appears a tad more youthful. Lookin' good, Larry! It must be the oats... ***Didn't get enough tea news in our Tea Time story above? Here's some more for you to savor... All this month at Dunkin' Donuts, you can get a freshly brewed iced tea -- any size -- for just 99 cents. A 16-oz. unsweetened tea has just 5 calories -- add Peach or Raspberry flavor for just 10 extra calories. Sweet! ***Many of us are familiar with the concept of "eating our emotions" when we're feeling blue, but a new study suggests consuming fast food could actually increase the risk of depression. Eeeks. Spare yourself some potential sadness and skip the drive-thru this week... or at least order smart when you're there (click for tips)! ***White-chocolate lovers, listen up! You must check out 5 Sparrows Sugar Free Coffee House White Chocolate drink mix. With just 35 calories per sugar-free serving, this decadent sweetened-with-stevia powdered mix is AMAZING and TOTALLY worth ordering online. It's a new staple here at the HG HQ. Click for the 411! That's all we've got. HG out! Move it along, you! Click "Send to a Friend" to pass this info to your pals.